Do we have any other zombie-bakers in the house? If so, this post is dedicated to you. Every time I visit a baking website or store I come up with new ideas for Halloween recipes and creepy food presentation. If you’ve been to the site before you may have realized this already. So far I’ve covered this year’s new Halloween-themed cupcake and cake options, and I’ve finally found some cookie cutters that befit our creepy kitchens. Cuz we know the traditional pumpkin and cat shapes are old hat. In the shapes of hands and feet, these small cookie cutters will make a delicious spread fit for zombies and cannibals alike. This could actually be one of the most simple, yet impressively presented, homemade treats in your spooky arsenal. I picture just small amounts of red icing on the fingertips & toenails (or almond slivers, as many “witch’s fingers” recipes suggest) and some of the digits being snipped off or malformed before baking. Unlike other roll-out/cookie cutter recipes, you won’t have to spend copious amounts of time frosting each one to make it look fantastic, and you won’t have to resort to those nasty pre-made dough packages from the store. One more upswing is less frosting = less sugar during a time when everything is loaded with sugar. Here’s an idea of what a stack of hand cookies looks like, and how deforming the hands and feet can give it an even creepier appearance. Traditional cookie cutter recipes tend to be of the white flour & white sugar variety, but I’ve got a great recipe that comes out a rich brown (“rotting hand brown”, shall we say?) and can be considered a low sugar treat. It’s actually sweetened only by molasses (which is actually a very concentrated sweetener!) but you can add a bit of maple syrup or sugar/fructose/stevia/xylitol before baking or sprinkle the unbaked hands and feet with a light dusting of sugar before popping them into the oven. I make this recipe frequently, and everyone except the ginger-hating crowd has given them great reviews. Mix dry and wet ingredients separately then add together to form a thick, soft dough. Refrigerate for 20 minutes. Grease cookie sheet. For rollout cookies, shape dough into 2 large balls and roll out on floured surface for cutting out. For drop cookies, roll into small balls and flatten with the bottom of a greased glass. 1/4″ thickness will produce crispy texture, and thicker cookies will be softer. If desired, sprinkle lightly with sugar before baking. Bake at 350F for 10 minutes. 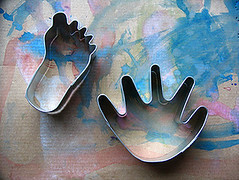 Let us know what you think of this recipe, and if you make some hand or feet cookies we’d love to see pictures! 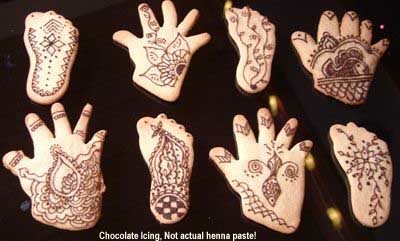 Subscribe to comments with RSS or TrackBack to 'Body Part Cookies'. I made the Molasses Sweetened Ginger Cookies last night. They are good! I used blackstrap molasses and they turned out a dark brown color. The cookies have a very strong flavor to them. If I were making these for little kids, I would probably use the lighter molasses and maybe a little less. I added about 1.5 teaspoons of Stevia to the mix and used 1/2 whole wheat flour & 1/2 spelt flour. My cookies were cut out in the shape of moose & turtles. Thanks for the great recipe! Do you have any other healthier roll-out cookie recipes you like? 365 Halloween Response: Stevia: what a genius idea! I agree about molasses and kids, but prefer using blackstrap myself. We’ll keep an eye out for more healthy roll-out recipes. Thanks for sharing your results!